Greenville, SC – Greenville Triumph Soccer Club has partnered with Legacy Early College to play its inaugural season at the school’s premier soccer facility. The proposal received initial approval from the Greenville County Board of Zoning Appeals at its Nov. 14 meeting. The board’s decision is expected to be finalized at its December meeting. The Triumph will play 14-16 home games in its initial season from March through September 2019. Dates and times have not yet been set. If approved by the Board of Zoning Appeals, construction will begin soon on temporary stands to accommodate approximately 4,000 spectators at the field on East Bramlett Road in the City View area on Greenville’s west side. 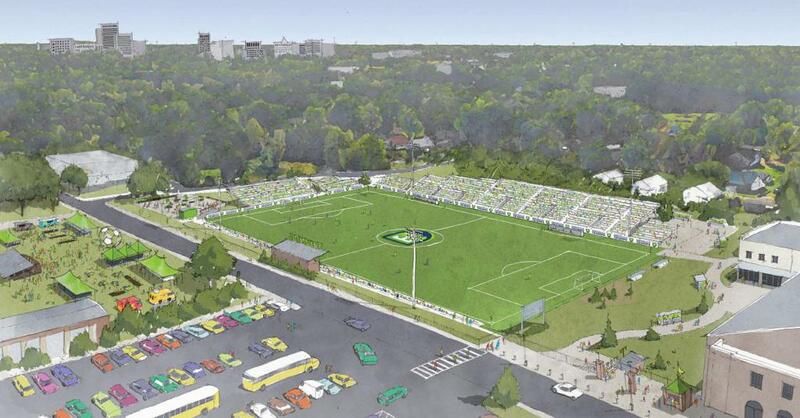 As part of the partnership, Greenville Triumph SC will create part-time game day jobs for Legacy scholars, upgrade the soccer field’s playing surface to bring it into FIFA compliance, and provide for construction of a permanent scoreboard. Greenville Triumph SC also will create a staff internship position for Legacy scholars beginning this spring and continuing through the first five seasons, and work to market Legacy scholar success stories to raise the profile of the school and its students. “The truth is, we hope and plan to continue this partnership for years to come knowing that what we can do for the scholars and families of Legacy Early College is far outweighed by the graciousness of their welcome for our organization and their exuberant embrace of the Triumph family,” Erwin said. The team completed a traffic study examining the impact of game day traffic to the neighborhood and plans to employ experienced traffic management, parking and security resources on game days. The team has identified sufficient parking near the field and has offered to work with area churches and businesses that want to sell parking during games. Because the school is within walking and biking distance of the Swamp Rabbit Trail, the team will provide bicycle parking, and will have dedicated drop-off zones for rideshare services such as Uber and Lyft. On game days, a family zone featuring games, face painting and concessions will be open to anyone and not require a game ticket. In the coming months, neighborhood youth will be invited to participate in free soccer clinics featuring members of the Triumph team. Greenville Triumph SC has been meeting with neighborhood residents, churches and businesses to get their feedback, and hosted a neighborhood meeting Nov. 8 at Legacy’s Parker Campus cafeteria to share information and answer questions. Season Ticket Priority Deposits can be placed at greenvilletriumph.com/priority-deposits through noon on Nov. 16. Supporters who have placed a deposit prior to noon on Nov. 16 are invited to select their seat at Legacy Early College on Sunday, Nov. 18. Time slots and additional information will be provided to deposit holders prior to the event. Season tickets will go on sale to the general public in early December. Fans can visit the website to place merchandise orders and to get the latest team updates and information.